Sir William Johnson, 1st Baronet (c. 1715 – 11 July 1774), was an Irish official of the British Empire. As a young man, Johnson moved to the Province of New York to manage an estate purchased by his uncle, Admiral Peter Warren, which was located amidst the Mohawk, one of the Six Nations of the Iroquois League. Johnson learned the Mohawk language and Iroquois customs, and was appointed the British agent to the Iroquois. Because of his success, he was appointed in 1756 as British Superintendent of Indian Affairs for the northern colonies. Throughout his career as a British official among the Iroquois, Johnson combined personal business with official diplomacy, acquiring tens of thousands of acres of Native land and becoming very wealthy. Johnson commanded Iroquois and colonial militia forces during the French and Indian War, the North American theatre of the Seven Years' War (1754–1763) in Europe. His role in the British victory at the Battle of Lake George in 1755 earned him a baronetcy; his capture of Fort Niagara from the French in 1759 brought him additional renown. Serving as the British Superintendent of Indian Affairs for the northern district from 1756 until his death in 1774, Johnson worked to keep American Indians attached to the British interest. His counterpart for the southern colonies was John Stuart. William Johnson was born around 1715 in County Meath, in the Kingdom of Ireland. He was the eldest son of Christopher Johnson (1687–1764) of Smithstown, Co. Meath and Anne Warren, daughter of Michael Warren of Warrenstown, Co. Meath and Catherine Aylmer, sister of Admiral Matthew Aylmer, 1st Baron Aylmer. His mother Anne was from an "Old English" Catholic gentry family who had, in previous generations, lost much of their status to Protestant English colonists. Christopher Johnson was descended from the O'Neill of the Fews dynasty of County Armagh. William Johnson's paternal grandfather was originally known as William MacShane, but changed his surname to Johnson, the Anglicisation of the Gaelic Mac Seáin. Some early biographers portrayed William Johnson as living in poverty in Ireland, but modern studies reveal that his family lived a comfortable, if modest, lifestyle.O'Toole (2005), p. 37 Although the Johnson family had a history of Jacobitism, William Johnson's uncle Peter Warren was raised as a Protestant to enable him to pursue a career in the British Royal Navy. He achieved considerable success, gaining wealth along the way. As a Catholic, William Johnson had limited opportunities for advancement in the British Empire. Never particularly religious, Johnson converted to Protestantism when offered an opportunity to work for his uncle in British America. William Johnson negotiating with a Mohawk Chief. History of the city of New York, 1896. Peter Warren had purchased a large tract of undeveloped land along the south side of the Mohawk River in the province of New York. Warren convinced Johnson to lead an effort to establish a settlement there, to be known as Warrensburgh, with the implied understanding that Johnson would inherit much of the land. Johnson arrived in about 1738 with twelve Irish Protestant families and began to clear the land. He purchased African slaves to do the heavy labor of clearance; they were the first of many slaves bought by Johnson. Warren intended Johnson to become involved in trading with American Indians, but Johnson soon discovered that the trade routes were to the north, on the opposite side of the river from Warrensburgh. Acting on his own initiative, in 1739 Johnson bought a house and small farm on the north side of the river, where he built a store and a sawmill. From this location, which he called "Mount Johnson", Johnson was able to cut into Albany's Indian trade. He supplied goods to traders who were headed to Fort Oswego, and bought from them furs when they returned downriver. He dealt directly with New York City merchants, thus avoiding the middlemen at Albany. The Albany merchants were irate, and Warren was not pleased that his nephew was becoming independent. Johnson became closely associated with the Mohawk, the easternmost nation of the Six Nations of the Iroquois League. By the time Johnson arrived, their population had collapsed to only 580, due to chronic infectious diseases unwittingly introduced by Europeans and warfare with competing tribes related to the lucrative beaver trade. The Mohawk thought an alliance with Johnson could advance their interests in the British imperial system. Around 1742, they adopted him as an honorary sachem, or civil chief, and gave him the name Warraghiyagey, which he translated as "A Man who undertakes great Things". In 1744, the War of the Austrian Succession spread to colonial America, where it was known as King George's War. Because of his close relationship with the Mohawk, in 1746 Johnson was appointed as New York's agent to the Iroquois, replacing the Albany-based Indian commissioners. The newly created "Colonel of the Warriors of the Six Nations" was instructed to enlist and equip colonists and Indians for a campaign against the French. Recruiting Iroquois warriors was difficult: ever since the so-called Grand Settlement of 1701, the Iroquois had maintained a policy of neutrality in colonial wars between France and Great Britain. Working with the Mohawk chief Hendrick Theyanoguin, Johnson was able to recruit Mohawk warriors to fight on the side of the British. Johnson organised small raiding parties, which were sent against the settlements of the French and their Indian allies. In accordance with New York's Scalp Act of 1747, Johnson paid bounties for scalps, although he realised this encouraged the scalping of non-combatants of all ages and both sexes. In June 1748, Johnson was made "Colonel of the New York levies", a position that gave him additional responsibility for the colonial militias at Albany. In July 1748, word was received of a peace settlement. The Mohawk had suffered heavy casualties in the war, which lessened Johnson's prestige among them for a while. In 1748, Johnson built a new stone house upriver from Mount Johnson, which became known as Fort Johnson. The home was heavily fortified when the next war approached. In 1755, Johnson shifted the primary meeting place for diplomatic councils between the British and the Iroquois from Albany to Fort Johnson. He also bought houses in Schenectady and Albany to stop at on his business trips to New York Town. After King George's War, Johnson was caught between rival New York political factions. 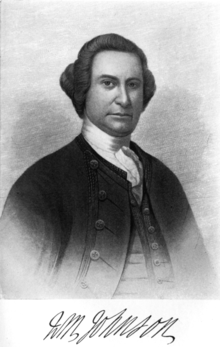 One faction was led by Governor George Clinton, who had appointed Johnson as New York's Indian agent and, in 1750, appointed him to the Governor's Council. Governor Clinton urged the New York Assembly to repay Johnson's outstanding wartime expenses, which amounted to £2,000. Repayment was blocked by Clinton's political rivals, a faction led by Lieutenant Governor James De Lancey, who was connected to the Albany Indian commissioners whom Johnson had supplanted. De Lancey was also the brother-in-law of Admiral Peter Warren, which added to the strain in the relationship between Johnson and Warren. An exasperated Johnson resigned as New York's Indian commissioner in 1751. When Warren died in July 1752, he left nothing to Johnson in his will. Although Warren died a very wealthy man, in his will he required that Johnson repay the expenses incurred while settling Warren's land. In June 1753, Hendrick Theyanoguin and a delegation of Mohawk travelled to New York City, where they announced to Governor Clinton that the Covenant Chain—the diplomatic relationship between the British and the Iroquois—was broken. The British government ordered Clinton to convene the Albany Congress of 1754 to repair the Covenant Chain. At the Congress, the Mohawk insisted that the alliance would be restored only if Johnson were reinstated as their agent. This mezzotint of William Johnson was published in London in 1756. 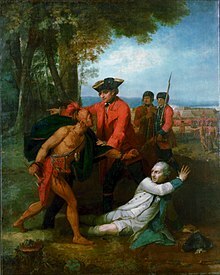 Johnson's reinstatement as Indian agent came the following year, just as the French and Indian War, the North American theatre of the Seven Years' War, was escalating. In 1755, Major General Edward Braddock, sent to North America to direct the British war effort, appointed Johnson as his agent to the Iroquois. Although Johnson had little military experience, he was commissioned as a major general and instructed to lead an expedition against the French fort at Crown Point. His troops were provincial soldiers paid for by the colonies, and not regular soldiers of the British Army, which meant that he had to deal with six different colonial governments while organising the expedition. Johnson initially had nearly 5,000 colonials at his command, but General William Shirley, the governor of Massachusetts who had been commissioned to lead a simultaneous expedition to Fort Niagara, shifted some of Johnson's men and resources to his own campaign. Tensions escalated as the two generals worked against each other in recruiting Native allies. The dispute was complicated by the unusual command structure: as Braddock's second-in-command, General Shirley was Johnson's superior officer, but when it came to Indian affairs, Johnson was theoretically in charge. In time, Shirley would blame the failure of his expedition on Johnson's refusal to provide him with adequate Indian support. According to the Johnson biographer Milton Hamilton, historians usually portrayed Johnson as acting unreasonably in the controversy with Shirley, but Hamilton argued that Johnson was reacting to Shirley's clumsy Indian diplomacy, which harmed the British relationship with the Six Nations. Marching north into French territory, in August 1755 Johnson renamed Lac du Saint-Sacrement to Lake George in honour of his king. On 8 September 1755, Johnson's forces held their ground in the Battle of Lake George. Johnson was wounded by a ball that was to remain in his hip or thigh for the rest of his life. Hendrick Theyanoguin, Johnson's Mohawk ally, was killed in the battle, and Baron Dieskau, the French commander, was captured. Johnson prevented the Mohawk from killing the wounded Dieskau, an act memorialized in later paintings of the event. The battle brought an end to the expedition against Crown Point, and Johnson built Fort William Henry at Lake George to strengthen British defences. In December, tired of army life, Johnson resigned his commission as major general. General Shirley, who had become the commander in chief upon Braddock's death, sought to have Johnson's commission as Indian agent modified so that Johnson would be placed under his command. But Shirley was soon replaced both as governor and commander in chief, and Johnson's star was on the rise. Although the Battle of Lake George was hardly a decisive victory, the British needed a military hero in a year of major setbacks, and Johnson became that man. Claims that Johnson had been disabled by his wound early in the battle, and thus did not participate in the victory, did not reduce the recognition given to him. As a reward for his services, Parliament voted Johnson £5,000 and King George made him a baronet. "Never was such an insignificant encounter so generously rewarded", wrote the historian Julian Gwyn. In January 1756, the British government made Johnson sole Superintendent of Indian Affairs for the northern colonies. This position gave him great influence and power, since he would report directly to the government in London and would not be controlled by provincial governments, as the Department was a military one. Of all the Indian nations in the northern colonies, Johnson was most knowledgeable about, and most closely connected to, the Iroquois Six Nations, especially the Mohawk. As superintendent, he would make the Iroquois the focus of British diplomacy, promoting and even exaggerating the power of the Iroquois Confederacy. Johnson also began a long process of trying to control Iroquois diplomacy, attempting "nothing less than the refurbishment of the Iroquois confederacy with himself as its centre". Although Johnson was no longer a British general, he continued to lead Iroquois and frontier militia. In August 1757, after the French began their siege of Fort William Henry, Johnson arrived at Fort Edward with 180 Indians and 1,500 militia. Greatly overestimating the size of the French army, British General Daniel Webb decided against sending a relief force from Fort Edward to Fort William Henry. The British were compelled to surrender Fort William Henry, after which many were killed in an infamous massacre. Stories circulated that Johnson was enraged by Webb's decision not to send help, and that he stripped naked in front of Webb to express his disgust. With the war going badly for the British, Johnson found it difficult to enlist the support of the Six Nations, who were not eager to join a losing cause. In July 1758, he managed to raise 450 warriors to take part in a massive expedition led by the new British commander, General James Abercrombie. The campaign ended ingloriously with Abercrombie's disastrous attempt to take Fort Carillon from the French. Johnson and his Indian auxiliaries could do little as British forces stormed the French positions in fruitless frontal assaults. 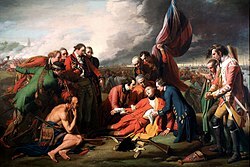 Johnson, in green, is depicted in Benjamin West's iconic painting The Death of General Wolfe, although he was not present at the event. In 1758, with the capture of Louisbourg, Fort Frontenac, and Fort Duquesne, the war's momentum began to shift in favour of the British. Johnson was able to recruit more Iroquois warriors. In the summer of 1759, he led nearly 1,000 Iroquois warriors—practically the entire military strength of the Six Nations—as part of General John Prideaux's expedition to capture Fort Niagara. When Prideaux was killed, Johnson took command. He captured the fort after ambushing and defeating a French relief force at the Battle of La Belle-Famille. Johnson is usually credited with leading or at least planning this ambush, but the historian Francis Jennings argued that Johnson was not present at the battle, and that he exaggerated his role in official dispatches. The conquest of Niagara drove the French line back from the Great Lakes. Once more, Johnson was celebrated as a hero, although some professional soldiers expressed doubts about his military abilities and the value of the Iroquois in the victory. Johnson commanded the "largest Native American force ever assembled under the British flag." Johnson accompanied General Jeffery Amherst in the final North American campaign of the Seven Years' War, the capture of Montreal in 1760. With the fall of New France to the British, Johnson and his deputy George Croghan spent much time negotiating with the former Indian allies of the French. In 1761, Johnson made a 1,000-mile (1,600 km) round trip to Detroit to hold a conference with the regional American Indians. Johnson confronted the assembled chiefs about the anti-British rumours that were circulating among the Natives, and managed, for the time being, to forestall outright resistance to the British military occupation of the West. Normand Macleod met Johnson at this conference and returned with him to New York. Macleod was later appointed as commander of Fort Oswego, on Lake Ontario. In 1762, Johnson founded the city of Johnstown on his grant, about 25 miles (40 km) west of Schenectady, New York, north of the Mohawk River. He named the new settlement, originally called John's Town, after his son John. There, at Crown expense, he established a free school for both white and Mohawk children. Outside the town, in 1763 he built Johnson Hall, where he lived until his death. He recruited numerous Irish immigrant tenant farmers for his extensive lands, and lived essentially as a feudal landlord. He also purchased African-American slaves to work as labourers, especially in his lumber operations. Johnson had some 60 slaves working for him, making him the largest slaveholder in the county and likely in the province, comparable to major planters of the South. In 1766, Johnson organised St. Patrick's Lodge, No. 4, a Freemason lodge, at Johnson Hall, and was installed as its master. His nephew Guy Johnson succeeded him as master of this lodge in 1770. Johnson was a strong supporter of the Anglican Church in the colony. To counter the influence of French Catholic missionaries in western New York, in 1769 he paid for the construction of an Anglican church for the Mohawk of Canajoharie, a village the British called the "Upper Castle". The building, later used by European-American congregations and known as Indian Castle Church, still stands near Danube, New York. It is part of the Mohawk Upper Castle Historic District, a National Historic Landmark. In 1771, Johnson built St. John's Episcopal Church in Johnstown, but soon complained that it was "small and very ill built." Within five years, he arranged for a larger church of stone to be constructed to accommodate the growing congregation in Johnstown. The historic church is still operating. In 1763, Pontiac's War resulted from Native American discontent with British policy following the French and Indian War. For several years prior to the uprising, Johnson had advised General Jeffery Amherst to observe Iroquois diplomatic practices, for instance, awarding gifts to Native leaders, a practice they considered an important cultural symbol of respect and significant to maintaining good relations. Amherst, who rejected Johnson's advice, was recalled to London and replaced by General Thomas Gage. Amherst's recall strengthened Johnson's position, because a policy of compromise was required with the Indians, and this was Johnson's domain. Johnson negotiated a treaty with Pontiac in 1766, which finally ended the war. From July to August 1764, Johnson negotiated a treaty at Fort Niagara with about 2,000 American Indians in attendance, primarily Iroquois. Although most Iroquois had stayed out of the war, the Seneca from the Genesee River valley had taken up arms against the British, and Johnson worked to bring them back into the Covenant Chain alliance. Johnson convinced the Iroquois to send a war party against the Seneca involved in the uprising, but otherwise the Iroquois did not contribute to the war effort as much as Johnson had desired. Johnson was a proponent of the Royal Proclamation of 1763, which called for tighter imperial control and restraint of westward colonial expansion. Johnson negotiated the details of the boundary defined in the Fort Stanwix Treaty of 1768. Against instructions from London, Johnson pushed the boundary 400 miles (640 km) to the west, enabling him and other land speculators to acquire much more land than originally authorised by the British government. Johnson was strongly criticised for exceeding his instructions, but many of the land speculators were well-connected in the government, and the expanded boundary was allowed to stand. Native American discontent continued to grow in the west in the 1770s. Johnson spent his final years attempting to prevent another uprising like Pontiac's War. Pursuing a policy of divide and rule, he worked to block the emergence of intertribal Native American alliances. His final success was his isolation of the Shawnee before Dunmore's War in 1774. In his lifetime, Johnson gained a reputation as a man who had numerous children with several European and Native American women. At the time, men were not ostracised for having illegitimate children, as long as they could afford it and supported them. One 20th-century scholar estimated that Johnson had perhaps 100 illegitimate children, but the historian Francis Jennings argued that "there is no truth in wild stories that he slept with innumerable Mohawk women." In his will, Johnson acknowledged children by Catherine Weisenberg and Molly Brant, German and Mohawk, respectively, with whom he had long-term relationships. He implicitly acknowledged several other children by unnamed mothers. In 1739, shortly after arriving in America, William began a relationship with Catherine Weisenberg (c. 1723–1759), a German Electorate of the Palatinate immigrant. She originally came to the colonies as an indentured servant, but had run away, perhaps with the help of friends or relatives. According to tradition, she was working for another family near Warrensburgh when Johnson purchased the remainder of her indenture contract, perhaps initially to have her serve as his housekeeper. There is no record that the couple ever formally married,; Weisenberg was Johnson's common-law wife. The couple had three children, including daughters Nancy and Mary (Polly), and a son John, first christened under only Weisenberg's name at Fort Hunter. The senior Johnson later arranged for his son John to inherit his title and estates as John Johnson. A grandson of Sir William Johnson was the 3rd Baronet Sir Adam Gordon Johnson who was, through his mother Ann Watts, descendants of the Schuyler family, the Delancey family, and the Van Cortlandt family of British North America. At the same time, Johnson had a relationship with Elizabeth Brant, a Mohawk woman by whom he had three children: Keghneghtago or Brant (born in 1742), Thomas (1744) and Christian (1745); the latter two boys died in infancy. About 1750, Johnson had a son named Tagawirunta, also known as William of Canajoharie, by a Mohawk woman, possibly Margaret Brant, Elizabeth's younger sister. Johnson may have also been intimate with the sisters Susannah and Elizabeth Wormwood, and an Irish woman named Mary McGrath, by whom he appeared to have had a daughter named Mary. Mary, Keghneghtago (Brant), and Tagawirunta (William) received inheritances in Johnson's will. In 1759, Johnson began a common-law relationship with Molly Brant, a Mohawk woman who moved into Johnson Hall and lived with Johnson as his consort for the rest of his life. Molly was the older sister of Joseph Brant; her younger brother joined the household when he was young. Johnson's relationship with Molly gave him additional influence with the Mohawk. The couple had eight children, all of whom received land from Johnson in his will. A grandson of William Johnson and Molly Brant was William Johnson Kerr who married Elizabeth Brant a daughter of Joseph Brant and granddaughter of George Croghan. Johnson died from a stroke at Johnson Hall on 11 July 1774 during an Indian conference. Guy Johnson, William's nephew and son-in-law (he had married Mary/Polly), reported that Johnson died when he was "seized of a suffocation." His funeral in Johnstown was attended by more than 2,000 people. His pallbearers included Governor William Franklin of New Jersey and the justices of the New York Supreme Court. He was buried beneath the altar in St. John's Anglican church, the church he founded in Johnstown. The next day chiefs of the Six Nations performed the traditional Iroquois condolence ceremony, and recognised Guy Johnson as Sir William's successor. 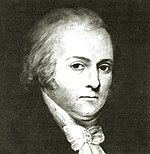 During the American Revolution, the rebel New York legislature seized all of Johnson's lands and property, as his heirs were Loyalists. In 1960 Johnson Hall was named a National Historic Landmark. It is a designated State Historic Site and open to the public. Johnson's most important legacy is the comparatively peaceful co-existence of Anglo-Americans and Indians during his tenure as Indian Agent for British North America. As an adopted Mohawk chief and husband, according to Iroquois law, of Mohawk Mary Brant, he was a trusted counselor and member of Mohawk nation and, through that affiliation, the Five Nations of the Iroquois. That position gave him standing not only to lead Iroquois into battle on the side of the English, but also to negotiate two treaties of Fort Stanwix, modern day Rome, New York. While the treaties deprived many Indians of land without their knowledge, they gave favourable terms to the Iroquois, and resulted in decades of comparative peace between traditional Indian residents and new settlers. Co-existence was part of Johnson's other major historical legacy: the protection of British sovereignty and Anglo-American settlement as a bulwark against French control of northern New York State and the Great Lakes region more generally. Johnson was instrumental in sustaining British-Iroquois alliance through the Covenant Chain, which consolidated both Iroquois and British territorial and commercial interests against the rival Algonquin and French interests in New France before 1763. After Britain assumed control, Johnson eventually won a political dispute over Indian policy with Lord Jeffery Amherst, who disdained the Iroquois alliance Johnson had so devoted himself to nurturing and defending. It was to Johnson that Pontiac finally surrendered after the eventual failure of the rebellion named for him. Old Fort Johnson, his first home built in 1749, is on the Historic American Buildings Survey. It is currently the home of the Montgomery County Historical Society, which operates a museum, gift shop, and holds events. Guy Park Manor, built in 1773, for Sir William's daughter Mary (Polly) and her husband, his nephew Guy Johnson, is also open to the public. The Johnstown High School mascot is the "Sir Bill" in Johnson's honour (or "Lady Bill" for all-female teams). The teams' sportswear often depicts Johnson's silhouette, wearing a tricorne hat. Johnson appears as an antagonist in the 2012 video game Assassin's Creed III, and he is killed by the game's protagonist, Connor Kenway. He also makes an appearance in the 2014 video game Assassin's Creed Rogue. He is also a prominent character in the book Manituana by Wu Ming. Johnson was portrayed by Pierce Brosnan in the television movie The Broken Chain. Wilderness Empire (1968) by Allan W Eckert tells Johnson's story through the device of historical fiction by extracting information from historical documents and filling in imagined events and dialogs to make the telling more accessible to the average reader. ^ Flexner, James Thomas (1959). Mohawk Baronet: A Biography of Sir William Johnson. Syracuse University Press. p. 292. ISBN 978-0-8156-0239-2. ^ O'Toole, Fintan (2005). White Savage: William Johnson and the Invention of America. Farrar, Straus and Giroux. p. 19. ISBN 978-1-4668-9269-9. ^ O'Toole (2005), pp. 19–20. ^ O'Toole (2005), p. 21. ^ Hamilton, Milton W. (1976). Sir William Johnson: Colonial American, 1715–1763. Port Washington, New York: Kennikat. pp. xi–xii, 5. ISBN 0-8046-9134-7. . The first of what was intended to be a two-volume biography; Hamilton never completed the second. ^ O'Toole (2005), p. 25. ^ O'Toole (2005), p. 36. ^ O'Toole (2005), p. 38. ^ O'Toole (2005), pp. 37-38. ^ O'Toole (2005), p. 41. ^ O'Toole (2005), pp. 41-42. ^ O'Toole (2005), p. 68. ^ O'Toole (2005), p. 43. ^ O'Toole (2005), p. 65. ^ O'Toole (2005), p. 69. ^ O'Toole (2005), p. 72. ^ Shannon, Timothy John (2008). Iroquois Diplomacy on the Early American Frontier. Viking. p. 62. ISBN 978-0-670-01897-0. ^ Shannon (2008), p. 122. ^ a b O'Toole (2005). ^ O'Toole (2005), p. 86. ^ a b c d e Jennings, Francis (1999). "Johnson, Sir William". American National Biography. New York: Oxford University Press. ^ O'Toole (2005), p. 161. ^ Hamilton (1976), p. 41. ^ Hamilton (1976), pp. 69–70. ^ O'Toole (2005), p. 89. ^ O'Toole (2005), pp. 90-95. ^ O'Toole (2005), p. 123. ^ Shannon (2008), p. 138. ^ Shannon (2008), pp. 139–140. ^ Johnson Papers, vol. 2, v–xii, 160. See also Revealing the Light: Mezzotint Engravings at Georgetown University, from the Georgetown University Library. ^ O'Toole (2005), p. 112-113. ^ Hamilton (1976), p. 120. ^ Hamilton (1976), p. 132. ^ Hamilton (1976), ch. 14, and 328–329. ^ O'Toole (2005), p. 135. ^ O'Toole (2005), pp. 142-143. ^ O'Toole (2005), pp. 146, 151. ^ Hamilton (1976), p. 190. ^ Hamilton (1976), pp. 194–195. ^ O'Toole (2005), p. 152. ^ O'Toole (2005), pp. 149, 154–155. ^ a b c Gwyn, Julian (1979). "Johnson, Sir William". In Halpenny, Francess G (ed.). Dictionary of Canadian Biography. IV (1771–1800) (online ed.). University of Toronto Press. ^ O'Toole (2005), pp. 153–154. ^ O'Toole (2005), pp. 158–165. ^ O'Toole (2005), pp. 189–190. ^ Hamilton (1976), p. 233. ^ Hamilton (1976), p. 236. ^ O'Toole (2005), pp. 239–240. ^ Hamilton (1976), p. 241. ^ O'Toole (2005), p. 203. ^ "Nomination of Johnson Hall to the National Register of Historic Places". National Park Service. 15 October 1984. ^ O'Toole (2005), p. 221. ^ Hamilton (1976), p. 297. ^ Hamilton (1976), p. 300. ^ Hamilton (1976), p. 301. ^ Decker, Lewis G. (1999). Johnstown. Images of America. Charlestown, South Carolina: Arcadia. p. 27. ISBN 978-0-7385-0174-1. ^ Williams-Myers, Albert James (1994). Long hammering: essays on the forging of an African American presence in the Hudson River Valley to the early twentieth century. Africa World Press. pp. 24, 29–30. ISBN 978-0-86543-302-1. ^ Pound, Arthur; Day, Richard Edwin (1930). Johnson of the Mohawks: A Biography of Sir William Johnson, Irish Immigrant, Mohawk War Chief, American Soldier, Empire Builder. New York: Macmillan. p. 447. ^ Pound & Day (1930), p. 446. ^ Snow, Dean R.; Guldenzopf, David B. "Indian Castle Church". Archived from the original on 22 June 2006. Retrieved 23 August 2009. ^ Flexner (1959), p. 301. ^ O'Toole (2005), p. 104. ^ Wallace, Paul A. W. (1971). Conrad Weiser, 1696-1760, Friend of Colonist and Mohawk. Russell & Russell. p. 247. , quoted in Jennings, Francis (1988). Empire of Fortune: Crowns, Colonies, and Tribes in the Seven Years War in America. Norton. pp. 77: note 13. ISBN 978-0-393-30640-8. ^ Hamilton (1976), pp. 33–34. ^ O'Toole (2005), pp. 44–46. ^ Hamilton (1976), p. 34. ^ Bazely, Susan M. (17 September 1996). "Who Was Molly Brant?". Kingston Historical Society. Cataraqui Archaeological Research Foundation. Archived from the original on 28 September 2011. Retrieved 10 October 2011. ^ Pound & Day (1930), p. 48. ^ ThePeerage.com page 15497 http://www.thepeerage.com/p15497.htm#i154970 Accessed March 15, 2015. ^ O'Toole (2005), p. 105. ^ O'Toole (2005), p. 106. ^ O'Toole (2005), pp. 106–108. ^ O'Toole (2005), pp. 106, 108. ^ O'Toole (2005), p. 174. ^ O'Toole (2005), p. 323. ^ O'Toole (2005), p. 324; For more on Johnson's Iroquois funeral, see William N. Fenton, The Great Law and the Longhouse: A Political History of the Iroquois Confederacy (Norman: University of Oklahoma Press, 1998; ISBN 0-8061-3003-2), 570–72. ^ "Back to School '16" (PDF). The Caesar Rodney School District Quarterly. Caesar Rodney School District: 15. 2016. Retrieved 18 October 2018. ^ Costiuc, Stanislav (28 July 2016). "Open-world mission design learnings from Assassin's Creed III". Gamasutra. UBM plc. Retrieved 18 October 2018. ^ Lewis, Anne (13 October 2014). "Assassin's Creed Rogue - Faces of Shay". Ubiblog. Ubisoft Entertainment. Retrieved 18 October 2018. ^ Voros, Drew (12 December 1993). "The Broken Chain". Variety. Penske Business Media, LLC. Retrieved 18 October 2018. Chisholm, Hugh, ed. (1911). "Johnson, Sir William" . Encyclopædia Britannica. 15 (11th ed.). Cambridge University Press. p. 472. Chichester, Henry Manners (1892). "Johnson, William (1715-1774)" . In Lee, Sidney (ed.). Dictionary of National Biography. 30. London: Smith, Elder & Co. pp. 50–52. Reynolds, Francis J., ed. (1921). "Johnson, Sir William" . Collier's New Encyclopedia. New York: P.F. Collier & Son Company. Rines, George Edwin, ed. (1920). "Johnson, Sir William" . Encyclopedia Americana. "More on Sir William Johnson" (PDF). The American Fly Fisher. Manchester, VT: American Museum of Fly Fishing. 11 (2): 2–6. Spring 1984. Archived from the original (PDF) on 29 November 2014. Retrieved 19 November 2014. Wikimedia Commons has media related to Sir William Johnson, 1st Baronet. Sir William Johnson, 1715-1774 - Papers, 1738-1808 (finding aid) at the New York State Library, accessed May 18, 2016.